The Gartner hype cycle is a model for representing the maturity, adoption and social application of technology. 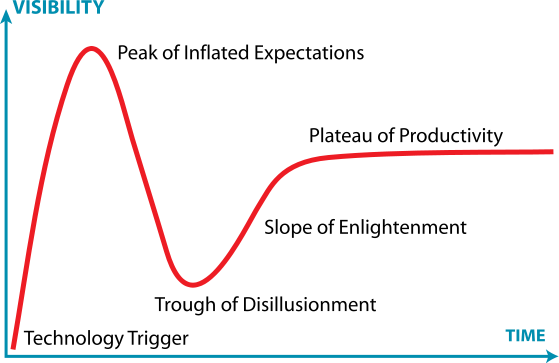 It consists of five phases, starting with a Technology Trigger and ending with the Plateau of Productivity. 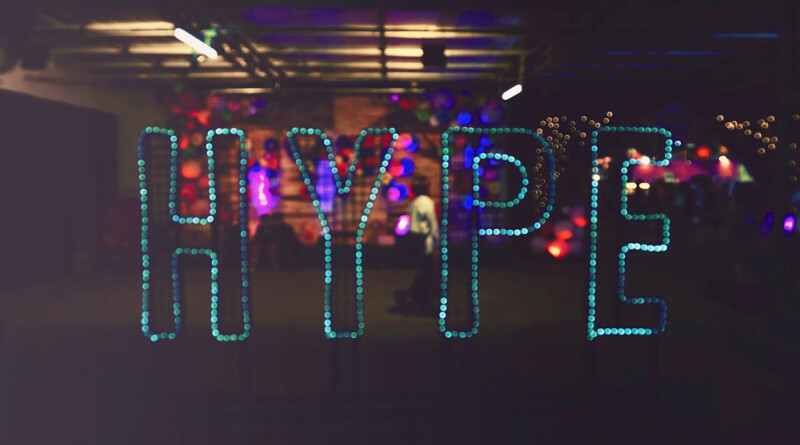 Gartner looks at emerging technologies on a regular basis and places them on the hype cycle. In this article, we look at the three technology trends that Gartner identified in their 2017 report, and how they affect product development. Software and the real world are growing closer together. From one end, more and more devices that can interoperate with the real world will be connected to networks (Internet of Things, IoT). On the other, we overlay reality more and more with digital information, with heads-up displays and virtual reality or augmented reality devices. Gartner sees these technologies already beyond the Peak of Inflated Expectations, and on the way to the Trough of Disillusionment. The trend of artificial intelligence (AI) is hard to miss: It’s all over the media, from autonomous vehicles to deep learning. AI can make a difference on many levels: It helps transforming the development process by finding insights on the next blockbuster product. It also provides data that is used in products. For instance, autonomous driving systems are trained using real-world data. And last, it can be a feature that is part of the product. Digital assistants from Apple, Google or Microsoft are examples for this. The World Wide Web demonstrated in an impressive manner what an open platform can enable. It is no surprise, that both hardware and software is getting a stronger platform character. This does not necessarily open – typically, the platform provider wants to reap the benefits of the platform. App stores are a good example from the software world, but this also extends to the real world, again with IoT or Industry 4.0. Gartner sees these technologies on the way to the Peak of Inflated Expectations.This means that we haven’t seen anything yet, and there is lots of room for disruptive surprises. Products are the life blood of companies, and the change that is happening right now is putting a lot of pressure on organizations: There is always the risk of being disrupted by a competitor, and it’s crucial to continuously develop new innovative products. It’s crucial to have a product development strategy that ensures competitiveness. The technologies shown here can be enabler for this. It’s important to look for business value, rather than to just follow buzz words. While these technologies can jump start brainstorming, the resulting ideas must fit into the bigger picture of an organization’s product development strategy. For instance, let’s look at the product definition process. Immersive technologies can make the products more tangible at an early stage in development by creating virtual prototypes. Also, we already see the emergence of platforms in the development process. Isolated “silo” tools like Rational DOORS are replaced by modern solutions that are designed for integration, like Jama Software. Standards like ReqIF extend the product definition process across organizations. Last, AI allows available data to be analyzed for insights. For instance, customer support information can be correlated to product development artifacts, identifying weak spots or desirable new features. Maintenance is another area that is heavily affected by these technologies. By using augmented reality, maintenance personnel can be guided, speeding up repairs and reducing the amount of training that is necessary. AI can be used to analyze systems in use to detect failures. By building modular product platforms, spare parts can be reduced significantly. In this highly competitive world, it is important to understand current technology trends, and how they affect product development. The three trends shown here are worth a closer look. Keep in mind that they cannot be applied blindly, but have to fit into your product development strategy.